This cute little card isn't my original idea. 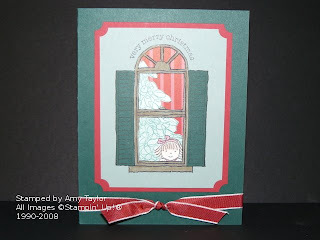 I modified it to use a Christmas tree stamp I had (Wondrous Gift stamp set), and Riding Hood Red Designer Series paper. It's a little tedious to cut out the window openings, but well worth the effect you get. The window and little girl are from the hostess level 3 set, Window Dressing. The window image is stamped onto Sage Shadow card stock in Jet-Black Staz-On ink. I then stamped it again onto Handsome Hunter card stock, and cut out the shutters. The window frame is colored in with a Creamy Caramel marker. The tree is stamped in Handsome Hunter ink onto Whisper White card stock, then use a sponge dauber to color in competely. Just layer the cut-out tree, little girl behind the window, place a piece of DSP behind that and put it all together. Really cute!